I was just told by a client to renew their expiring corporate domain and so I did. Not really thinking about searching around after renewing their domain, I checked my name and was surprised to learn that it's available ! 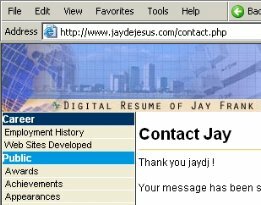 I remember not seriously checking for my name's availability on the net and it was taken. I kinda have an idea of what I want to put there. But for now, I'm just placing my online resume just so there would be something to see if you visit. Ussher? middle name o part pa rin ng first name mo? jhamie, hindi mo ba alam na alien 'tong si jay...hehe. ^_^. The Fall of the House of Ussher. asteeg..
hehehe... alam nyo pala ang The Fall Of the House Of Ussher ha. pero seriously, traces of our ancestors go up to Ireland, Bishop James Ussher ata yun of the 1500's. Ayrlund ei! Where the dandy leprechauns chill..hehe. Dapat heavy drinker ka pala at may brogue accent para majustify ang Irish roots.^_^ *picturing* Ayos!! !